Hi guys. I’m actually doing a monthly favourites post- aren’t you all proud!? First things first, however; I’m venturing into YouTube! I tried once way back before I changed this blog round but I never got much further than an overly-long E.L.F. haul video. However, this time I’ve downloaded Windows Movie Maker and got the hang of the basic editing tools, so all I need to do is save the money for a decent camera and I’ll be off! Luckily my laptop camera isn’t actually too bad so I should be okay in the meantime! You can find me at /smaugishvlog; I have two videos up at the moment (a video of this and my next post, and The British Tag), so have a look and let me know what you think! Also, I’m excited and wanted to share with you why! I was lucky enough to get my hands on a ticket for a Beauty Insider event at the Urban Decay counter at my local House of Fraser. They cost £5 and were strictly limited so when I was purchasing my Naked 2 and the girl mentioned, I grabbed one for myself and one for my mum. It’s on Thursday and you can bet I’ll be sharing it all with you! Now onto business- my March faves! My makeup faves for this month include the Models Own Blending Sponge, L’Oreal Miss Manga mascara, Soap & Glory One Heck of a Blot powder, Eyeko Skinny liquid liner and the L’Oreal Superliner Brow Artist brow pencil in Dark Brunette. 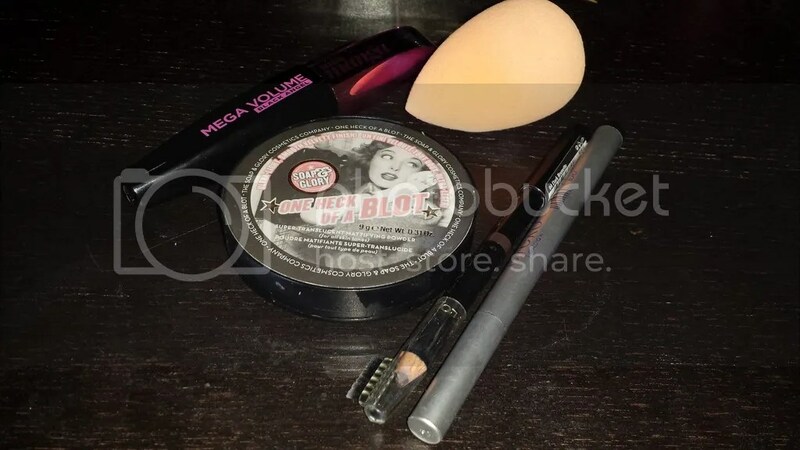 The blending sponge has revolutionized my makeup routine; I’m so glad I’ve finally mastered it! By using this, I can get a flawless and full coverage finish that doesn’t look cakey so it’s absolutely invaluable when it comes to wearing heavy duty foundations like my Estee Lauder Double Wear. Miss Manga is a mascara I recently acquired and really like! It’s super black and gives me the exact look I like from my lashes (big and sooty and dramatic); I’m interested in trying the new Punk version! The Soap & Glory powder, whilst much hyped, is one of my must-have products. I’ve hit pan and even though I’m planning to purchase a MAC Mineralize Skin Finish when mum and I hit Oxford Street this holiday, I will definitely have to repurchase this one. Even though my favourite liquid liner of all time is the Soap & Glory Supercat, I’ve used this Eyeko liner I got for free with a magazine quite a lot this month. When they say ‘Skinny’ they mean skinny! It’s really easy to get a precise, delicate line and flick with this one so even though I’m not sure I’ll be repurchasing/replacing my Supercat, I really like it. Finally, the Superliner brow pencil is an almost daily product for me. I found an MUA Power Brow in my make up draw that was unopened so I think I’ll take this pencil with me for touch ups. It’s dark without being ridiculously so and once it’s on, it’s on. It doesn’t want to smudge or anything! I also have three non-makeup favourites this month! Illamasqua Freak EDP is one of my favourite perfumes and I’ve been wearing it lots this month. I’m a bit of a scent fiend, though! 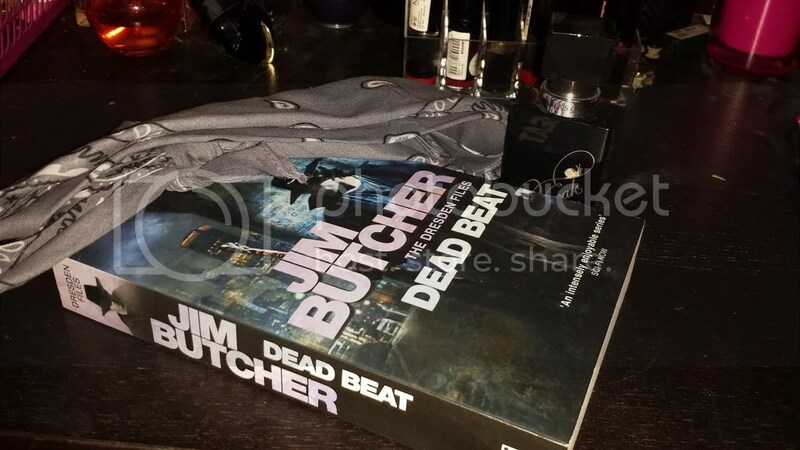 The Dresden Files series by author Jim Butcher are some of my current (and possibly all-time) favourite reads. I end up so engrossed by them, and I love the central character of Harry Dresden. I’m not very far into Dead Beat, the seventh novel, but so far so good! Finally, I’m loving Americana-style paisley bandanas! I pull my hair into little pigtails (fyi I am loving this length but also considering going an inch or two shorter come my next trim!) and tie this around and it just looks awesome. I love it! So that was my March favourites! What did you use lots last month? This entry was posted in Beauty, Fashionista Musings, Makeup and tagged Eyeko, Favourites, Freak EDP, Illamasqua, Jim Butcher, Loreal, March, Models Own, Soap & Glory. Bookmark the permalink.